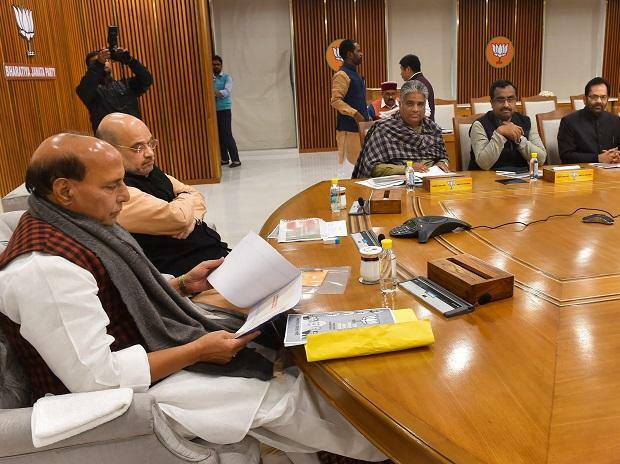 The BJP announced Tuesday that its senior central government ministers, chief ministers and other prominent leaders would be holding press conferences at around 50 places across the country for the next four days. "Through press conferences, the messages given by Prime Minister Shri Narendra Modi and party's national president Amit Shah during the National Convention - which was organised at historic Ramlila Maidan in Delhi - would be spread among the people of this country and party workers," the BJP said in a press statement. The press conferences would be given by senior central government ministers, current chief ministers and deputy chief ministers of the BJP-ruled states, former chief ministers belonging to the party, senior ministers of the BJP-ruled states as well as senior leaders of the party across the country. "People would be made aware of the bills put forward by the BJP during the recently-concluded Winter Session of Parliament," the statement added. A landmark bill seeking to provide 10 per cent reservation in jobs and education for the general category poor was passed by Parliament last week, with most parties backing the measure. "Union Defense minister Nirmala Sitharaman, Shri Dharmendra Pradhan, Shri Thawarchand Gehlot, Dr Jitendra Singh, Shri Narendra Singh Tomar, Shrimati Smriti Irani, General (Retired) V K Singh, Shri Gajendra Singh Shekhawat, Shri Rajyavardhan Singh Rathore, Shrimati Poonam Mahajan and various other central ministers would be addressing press conferences across the country," the BJP said. "Along with unmasking the politics lies of the Congress and company, the press conferences would tell people about the achievements and welfare policies of the BJP government, which is led by Prime Minister Narendra Modi at the Centre," it added.